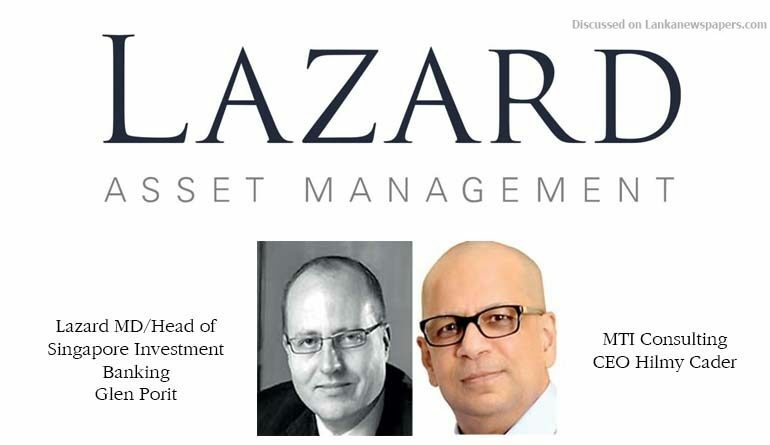 Recognised as one of the world’s preeminent financial advisory and asset management firms, 170-year-old Lazard has shown interest in Sri Lanka, with a visit this week by an international delegation, in co-operation with MTI Consulting. The $ 2.7 billion global financial advisory firm, in conjunction with MTI Consulting, plans to meet officials of the Sri Lankan Government and discuss how Lazard could work with Government in its attempt to divest and attract foreign investments for its large non-strategic assets like hotels. Lazard is a leading international investment bank dedicated to financial advisory and advises on many of the largest and most complex transactions, including advising Starwood Hotels on its sale to Marriott and Hotel Investment Partners on its sale to Blackstone. It has a world-leading sovereign advisory team that has a long and strong track record of advising governments and public entities, advising on more notable transactions than any of its competitors. Globally, Lazard has $ 249 billion of Assets under Management and its Asset Management business serves a diverse global client base that includes pension funds, sovereign wealth funds, governments, multinational corporations, financial institutions and high-net-worth individuals. MTI Consulting is Sri Lanka’s leading strategy consultancy and is part of an internationally-networked, boutique consultancy network that enables clients to ‘Analyze> Strategize > Realize’ profitable business opportunities. In Sri Lanka, over the last 20 years, some of the top corporate organisations have benefitted from MTI’s expertise. This includes the likes of Abans, Access Engineering, Aitken Spence, Akbar Brothers, AMW, Bank of Ceylon, Browns, Carsons, Ceylinco Insurance, Chartered Accountants, CIC, Delmege, Dialog Axiata, DIMO, DuPont, Expo, EDB, Galle Face Hotel, HNB, Hayleys, Hirdaramani, HSBC, Lanka IOC, Lake House, Laugfs, LCI, LOLC, MAS, McLarens, Metropolitan Group, National Savings Bank, Odel, People’s Bank, Renuka Group, Seylan Bank, Sri Lanka Telecom, Singer, SriLankan Airlines, Sri Lanka Tea Board, Sunshine Holdings, Union Bank, United Motors and Walkers MTD.